Examining the daily intake and output of calcium in layer hens can aid us in designing a better feeding program that will prolong the egg production cycle while maintaining eggshell quality. Let us examine the daily balance of calcium intake and output in a layer hen. She is about 35 weeks of age, at the peak of her egg production cycle. Under most commercial situations, she is likely to consume about 100 grams of a feed containing 4 percent total calcium (and no more than 0.4 percent total phosphorus). Thus, her daily intake of calcium is about 4,000 mg. The majority of this feed is consumed during the first hours after daybreak, whereas a small amount might be available during the rest of the day, depending on appetite and feed management practices. From the 4,000 mg of calcium ingested, the hen will lose (in feces) about 500 mg as indigestible. This is 12.5 percent of total calcium intake, which means there is considerable room for improving calcium digestibility. Another 400 mg of calcium will be excreted through urine, whereas 100 mg of calcium will be returned to the bones' reserves, leaving about 3,000 mg for the egg. Of these, 2,000 mg will go to the eggshell and the remaining to yolk and albumen formation. Egg formation begins with the formation of the yolk and albumen, which requires protein and energy deposition to occur early in the day. This requirement coincides with the feed consumption peak period. Later on, calcium requirement for eggshell formation peaks starting from early afternoon until late evening hours. At this time, feed intake is minimal and meeting calcium requirement depends on calcium absorbed through feed earlier on and on calcium release from bone reserves. Readily available calcium bone reserves amount to about 1,000 mg, of which the hen can mobilize no more than 100 mg per day. When calcium-deficient diets are fed for a prolonged period of time, these reserves are depleted within days, and damage might occur if the hen starts mobilizing calcium needed for structural purposes — hence, locomotion problems in layers fed diets deficient in calcium. 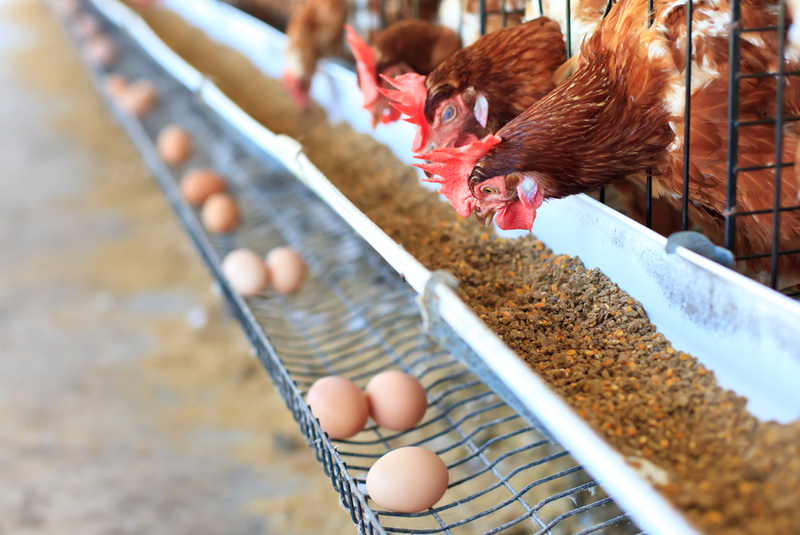 Feeding a part of dietary calcium in large particle size is a means of ensuring sufficient calcium remains within the gut for the hen to continue to absorb and utilize even during times of calcium peak demand. To this end, coarse limestone (2-5 mm) and oystershell (2-8 mm) are used, but as they can be abrasive to mechanical equipment, they are frequently offered as a top-dressed supplement during the evening hours. Adding organic acids has been shown to improve calcium digestibility, especially in older hens. Ensuring hens receive adequate levels of vitamin D, which is associated with calcium absorption, is also a good way of keeping calcium uptake at high levels. Here, it should be noted that the mycotoxin zearalenone binds vitamin D and can cause secondary calcium deficiency. Minimizing excess dietary phosphorus can also lead to increased calcium availability, as phosphorus can bind calcium in the gut rendering it unavailable. In addition, phosphate salts often contain contaminating minerals that can interfere with calcium metabolism and eggshell formation. Finally, saline water and excess dietary salt can cause reduced calcium availability, leading to eggshell deterioration. Adding vitamin D and/or vitamin C in drinking water has been shown to reduce the impact of zearalenone and excess chloride, respectively. Eggshell quality often deteriorates as hen age progresses. This is caused first by the increasing size of the egg, for which the hen cannot deposit more than 2,000 mg calcium, and also by the reduced availability of feed derived calcium. At the end, older hens tend to overdraw from their bone reserves, leading to locomotion problems and reduced egg production. Increasing dietary calcium is not an option as this will exacerbate an already strained calcium absorption system and cause liver damage. Liver-protecting agents might be beneficial here, but more work is required to find suitable compounds that are truly effective. Improving calcium availability using the means described above also becomes problematic, as the hen’s organism cannot cope with the strain of high productivity required by modern birds. Understanding the daily balance of calcium intake and output in modern hens is paramount in ensuring maximal production, hen longevity, health and welfare. Relying on daily feed intake to meet calcium needs is often inadequate. Measures to ensure that calcium availability for egg deposition remains high become more important as hens enter the later phase of their production cycle. Reduced feed and bone calcium availability cannot be prevented, but it can be slowed down.